Joe Mondragón “tugged on his irrigation boots, flung a shovel into hispickup and … opened the Roybal ditch headgate,” diverting water from Indian Creek into his parents’ old bean field in northern New Mexico—-sparking a pitched battle between farmers with deep ties to the land and newly arrived developers bent on big bucks. So goes the pivotal moment in the popular 1974 novel by John Nichols that in 1988 Robert Redford made into a movie, The Milagro Beanﬁeld War, set in a ﬁctional small town called Milagro (“Miracle”). What’s real in the tale is the ditch: It’s an acequia, an irrigation system upon which the Mondragón family farm depends and whose technology and methods of community water distribution go back all the way to early civilizations in the Middle East, speciﬁcally to al-Andalus, Muslim Spain. Indeed, during a week spent in New Mexico to report on its acequia heritage, I found myself imagining what it would be like to wear Mondragón’s boots. When I told people at home in Washington, D.C., that I was going to New Mexico to investigate acequias, I had to spell out the word and pronounce it slowly, “ah-SIH-kee-ah.” No one knew what I was talking about. At the other extreme was the innkeeper at the Dreamcatcher B&B in Taos, New Mexico, who informed me without missing a beat, “There’s an acequia right behind your room” and then took me out for a view. The one immutable truth I learned is that there’s no middle ground when it comes to acequias: People either have no idea what you’re talking about or they’re passionate about them. Through the seasons, a selection of acequias in New Mexico. The gravity-ﬂowing irrigation ditches evolved over 10,000 years from the arid regions of the Middle East. My own visit to New Mexico started in Albuquerque with a tutorial on acequias in bravura style by José A. Rivera of the University of New Mexico and author in 1998 of Acequia Culture: Water, Land and Community in the Southwest. Acequias, he explained, have not just history, but also culture, governance and issues of sustainability. He pointed me to the nearby Maxwell Museum of Anthropology, where a recent exhibit featured artworks and 130 objects relating to digging and maintaining the waterways. One painting in the exhibition showed water from an acequia seeping through the ground to recharge the aquifer below. Other exhibits included a wooden headgate to open and shut the acequia’s ﬂow (perhaps of a type Nichols had imagined for Mondragón); a pair of overalls and rubber boots worn by a mayordomo, or water master; and the rusted back end of an early 1950s Dodge pickup, displayed as a typical mode of transportation to and from acequias. A bumper sticker proclaimed, “Our Acequias: Life, Culture, Tradition”—ﬁghting words in a region where it’s not just The Milagro Beanﬁeld War but real communities, government authorities and property developers that are cooperating and contesting the water rights that mean the difference between feast and famine, endurance and eviction. Three days later I was driving north out of Santa Fe following the Rio Grande through the Espanola Valley on New Mexico State Road 68, also known as the “River Road to Taos.” Soon I was in real “Milagro Beanﬁeld” territory, for the ﬁlm was shot at Truchas, just 30 kilometers east. This road began as the northern leg of the Camino Real de Tierra Adentro (Royal Road to the Interior Lands), Spain’s 2,400-kilometer route of conquest from Mexico City that reached north to Taos. On this road in July 1598, Capitan General Don Juan de Oñate brought the ﬁrst Spanish settlers to New Mexico and established one of the earliest European settlements in what is now the United States. [They built] dams made of logs, brush, rocks and other natural materials…. Using wooden hand tools, the digging of earthen ditches and laterals would follow the construction of the main diversion dam…. [T]hese irrigation works included … the acequia madre (mother ditch or main canal), compuertas (headgates), canoas (log ﬂumes for arroyo crossings), sangrias (lateral ditches cut perpendicular from the main canal to irrigate individual parcels of land) and a desague channel, which drains sur-plus water back to the stream source. The acequia network channeled the swollen ﬂow of springtime mountain snowmelt into community ﬁelds and gardens that blossomed with jalapeño peppers, blue corn, squash, lettuce, cabbage, peas, garbanzos, cumin seed, carrots, turnips, garlic, onions, artichokes, radishes and cucumbers. More than 400 years later, these same crops are grown in the Espanola Valley, some still watered by acequias. 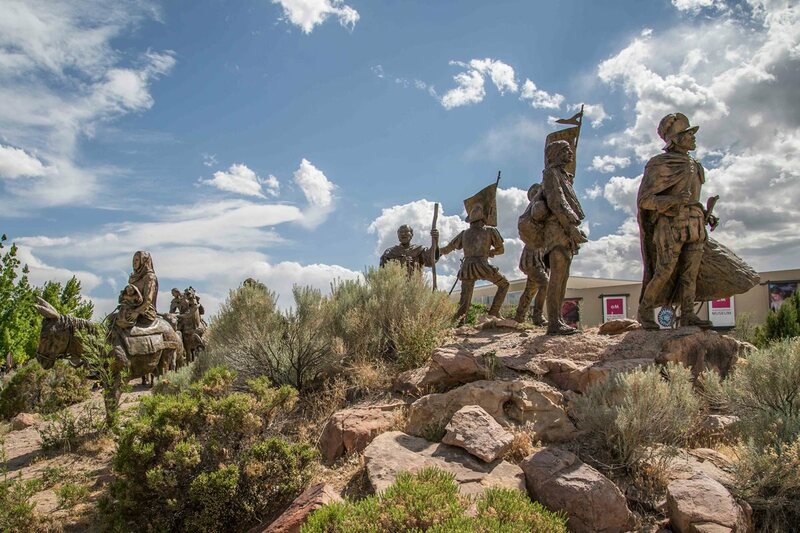 La Jornada, the journey of the ﬁrst Spanish settlers through the region in the late 16th century, is commemorated in statues at the Albuquerque Museum. Today’s “River Road to Taos” follows their route up the Rio Grande north from Santa Fe through the Espanola Valley. In 1610 Oñate’s successor, Pedro de Peralta, moved the capital to Santa Fe. Once again, building acequias was the ﬁrst order of business. On each side of the Santa Fe River, an acequia madre was dug, and eventually dozens of ace-quias sustained the growing population. Today, although the city’s acequias no longer serve primarily for agriculture, they are a treasured part of the urban scene: One of Santa Fe’s prettiest streets is the narrow, winding street named Acequia Madre. In following years, acequias were built also across much of the Southwest in lands that became Texas, Colorado, Arizona and California, but it is in New Mexico that the system proved most durable. Today New Mexico boasts some 800 active acequias, all survivors of political, legal and administrative changes through the Spanish (1598-1821), Mexican (1821-1848) and Territorial (1848-1912) periods, as well as us statehood, to the present day. After New Mexico, Colorado comes next with an estimated 150 active acequias in the four southern counties of Costilla, Conejos, Huerfano and Las Animas. By contrast, in the other states, most colonial-era acequias were abandoned or supplanted by private mutual ditch companies, water-user associations, irrigation districts or conservancy districts. Few remain in Arizona, California and Texas—although San Antonio has preserved one near Espada Dam southeast of the city. Members of the acequia community in New Mexico’s Embudo Valley near Dixon clear debris from an irrigation canal in the annual “spring cleaning,” supervised by mayordomo (water master) Mark Olivas. 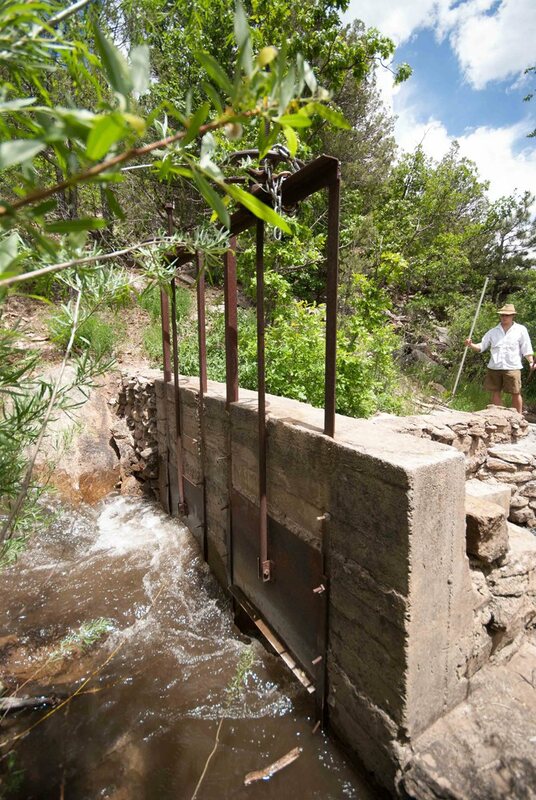 An acequia headgate controls the ﬂow of water into a field for irrigation. The amount of water allocated to each landowner is determined by the mayordomo based on that year's snowfall and rain levels. Rivera explained that the word “acequia” refers not only to the physical trench in the ground, but also, and just as importantly, to the system of community self-governance. 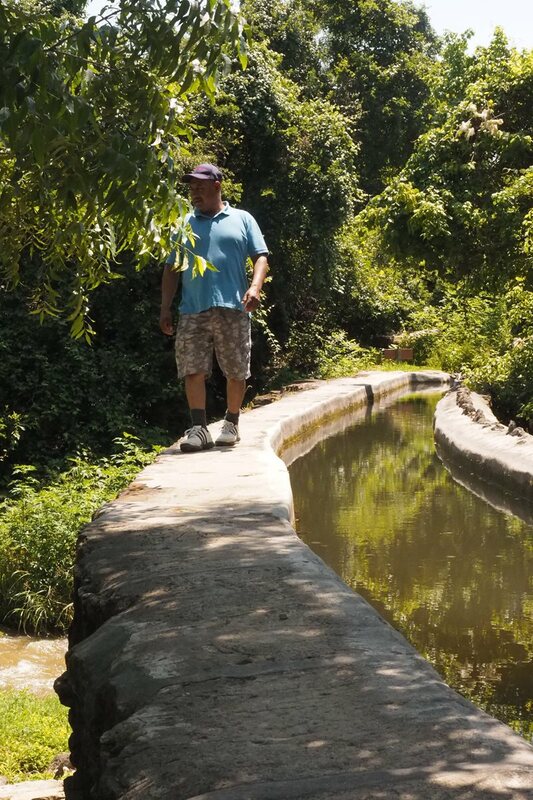 “You don’t just have a ditch; you belong to an acequia,” he explains, emphasizing that the word also means the co-op of farmers who share the water and govern their own use of it. So important are the organizations that the state of New Mexico recognizes acequias as political subdivisions. The acequia elects its own mayordomo, whose role has antecedents in the Moorish sahib al-saqiya, or “water giver,” who assesses how much water is available daily and prescribes times for each farmer to water his crops. Paula Garcia, executive director of the New Mexico Acequia Association performs an annual ritual during an association meeting. José A. Rivera of the University of New Mexico and author of Acequia Culture: Water, Land and Community in the Southwest speaks during a New Mexico Acequia Association meeting. This modern concrete acequia headgate controls the ﬂow of water into ﬁelds through multiple “doors.” The local mayordomo decides how to share the water channeled from rivers and streams. The renewed ﬂow of water that followed the work marked a festive time. “Kids would run ahead … yelling, ‘the water is coming!’” wrote New Mexico historian and former mayordomo Juan Estevan Arellano in Enduring Acequias: Wisdom of the Land, Knowledge of the Water, published just before his death in 2014. [This concept, called equidad, or equality, comes directly from the Qur’an. Under Muslim law, possibly because it evolved in the desert, people must never deny water to another being. This is called the Law of Thirst [haq-i-shurb]. To portion water out to other beings, including animals and plants, is considered a zakat or pious charity. This concept has been practiced in northern New Mexico forever. I am told that my grandfather always had a trough full of water for travelers and their animals. Our people never thought of selling water. In New Mexico acequia water was historically treated as a com-munity resource that irrigators had a shared right to use and a shared responsibility to manage and protect. With statehood, however, came the Doctrine of Prior Appropriation. Based on the principle that water rights are not connected to land ownership, it meant that water—from any source—could be sold or mortgaged like other property. This gave rise to the populist Southwest adage, “water ﬂows uphill to money”—or, more sim-ply, water ends up being owned by the rich and powerful. An acequia unique in the US stands near Espada Dam, southeast of San Antonio, Texas. Water once vital to ﬁelds in the area still ﬂows over a slash in the hillside called Sixmile Creek via an aqueduct completed in the mid-1700s. 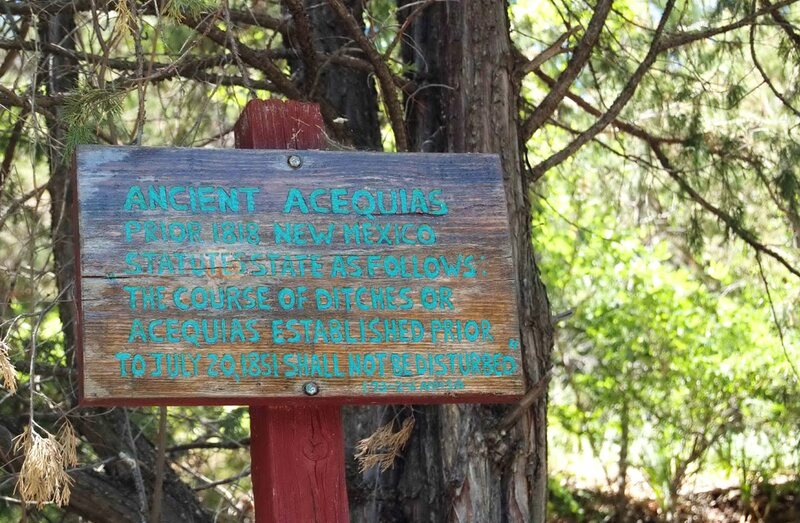 Starting in the late 1980s, there was a burst of “acequia activism” in New Mexico that culminated in 1988 with the establishment of the statewide New Mexico Acequia Association (nmaa) and, around the same time, farmers formed regional acequia associations. In a major legislative victory for the groups, the New Mexico Legislature enacted a law in 2003 allowing acequias to block water transfers outside the physical acequia if detrimental to it or its members. Although some developers disparage acequias as water-guzzlers, the claims are disproved by recent research. 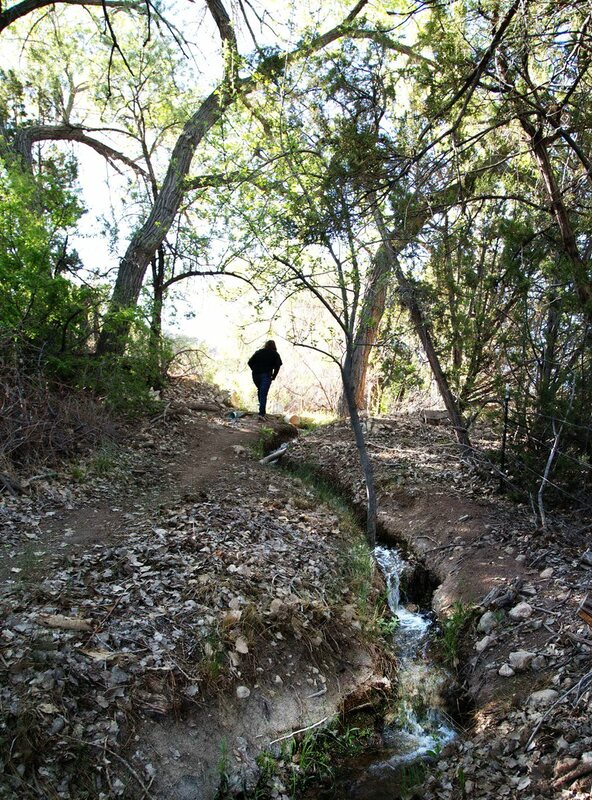 Studies by hydrologist Alexander “Sam” Fernald, professor of watershed man-agement at New Mexico State University in Las Cruces, show that traditional earthen irrigation ditches offer hydrologic beneﬁts beyond simply delivering water to crops. 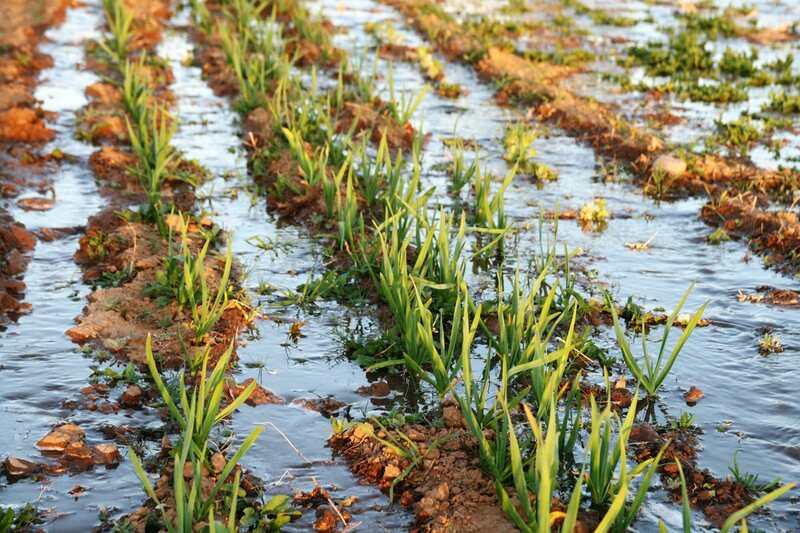 Irrigated by an acequia, a thirsty garlic crop soaks up water near Santa Cruz, New Mexico. His data show that, on average, only seven percent of the water diverted from the Rio Grande into a north-central New Mexico acequia is lost to evapotranspiration—the sum of evaporation from all sources, including water vapor released by plants. The remaining 93 percent returns to the river, 60 percent as surface water from irrigation tailwater and 33 percent as groundwater. Acequias also help build healthy aquifers by ﬁltering the water that percolates underground: Aquifers are key sources of drinking water. Furthermore, they bene-ﬁt livestock, which can drink directly from acequias rather than going to the river. “Most people are unaware of these positive effects of acequias,” says Fernald. About 15 kilometers north of Taos, Sylvia Rodriguez lives in a casita (“small house”) in the acequia community of Valdez. She is emeritus professor of anthropology at the University of New Mexico and author in 2006 of Acequia: Water Sharing, Sanctity and Place. A woman walks along an acequia in New Mexico, which boasts some 800 working acequias, the largest number among the five southwestern states where the irrigation systems are found. The day after the delegation arrived, several hundred spectators gathered for the weekly meeting of the tribunal that has been deciding cases outside the Cathedral of Valencia at noon on Thursday since Moorish times—when the great Mosque of Valencia stood near the same spot. The court is comprised of eight Hombres Buenos (“good men”), farmers elected every two years to represent their fellow irrigators of the huertas, the vast, fertile ﬂoodplains steeped in history that remain crisscrossed with acequias. Delegates also took a bicycle tour of the huerta. That “was important for me personally, to see the landscape (paisaje de l’agua), the acequias and the elaborate system of houses and head-gate mechanisms,” Rodriguez wrote. “The challenges and struggles Spanish acequias face—urban and real-estate development, demographic change, drought and climate change—are essentially the same ones we face. This means that we are not alone. Anthropologist and photographer Donatella Davanzo is a doc-toral student at the University of New Mexico who specializes in acequia cultures and systems as well as Southwestern Na-tive cultures and Route 66. She lives in Albuquerque.